One of the many things I am blessed by my partnership with ASICS America is being coached by professional Marathon Coach Andrew Kastor. He helped me achieve the impossible at 2014 with the TCS NYC Marathon. I only had two months to train and within those two months, my destination wedding and two week long honeymoon. I still managed to pull of a 35 minute PR with non favorable weather conditions. Moving forward to 2015, Coach Kastor is currently working to get me ready for the Dublin Marathon (10 weeks from today!). Now Coach Kastor can help achieve your Marathon goals too! He worked with ASICS to create a 12 week marathon training guide which you can use along with the MyASICS app (which I strongly suggest) to personalize with your age, gender and specific race goals. 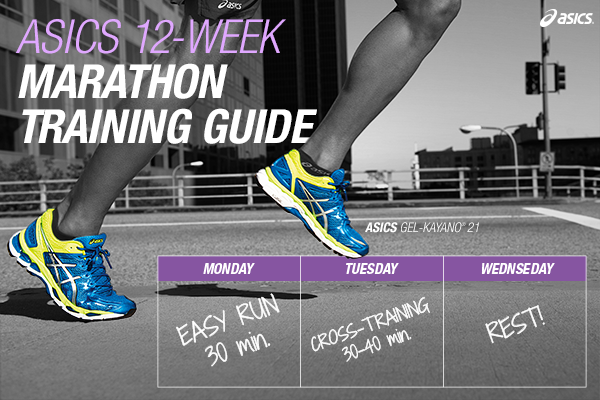 Click here to be taken to ASICS 12 Week Marathon Training Guide if you are having problems reading the one below. This is a fantastic 12 week plan that will help you achieve your specific goals. Along with the plan, Coach Kastor also gave 10 Marathon training tips below. Coach Kastor explains that during most of your training, it’s important to run on a surface that is similar to the one that you will encounter on race day. This surface is typically pavement, which causes the mid-sole of your shoe to breakdown, so make sure to replace your training shoes every 250-300 miles if training mainly on pavement. Change up your surfaces (dirt or trail) during mid-week training sessions to diffuse the impact on your body. Running on grass, wet sand, dirt trails or tracks will activate and strengthen different muscles, helping prevent injury and fatigue. Also train for hills to practice running down them softly, which reduces the impact on your body. Focus most of your marathon training at a comfortable, steady pace, but add quick, short distance strides (gentle sprints) into your various sessions. Incorporating strides improves speed development, muscular power, stride length and flexibility, helping to keep you injury free. Calculate your goal marathon race pace with MyASICS and evaluate if this pace is too difficult to maintain during your Goal Marathon Race Pace Runs (GMRP). Your pace should be comfortable, so if you can’t maintain this pace, add 10-15 seconds per mile the next week to your GMRP run and reevaluate your goal pace for the marathon. Practice drinking the same fluids (electrolyte-replacement drinks), gels, blocks or beans that you will be taking on race day to teach your body to process and digest comfortably before race day. You should also try eating the exact meal that you will ingest the morning of the race during your final runs. Log 50-100 miles in your race day shoes prior to running the marathon. Train in your planned race day shoe/sock combination during the last few weeks leading up to your race. This will help ensure that you have happy feet for all 26.2 miles! Sitting around in your sweaty clothes tends to rapidly cool down your body and causes your muscles to tighten or seize up, leading to injuries. Slip into some dry workout gear to keep you dry and injury free. Massage therapy, cool baths, sleep and nutrition are critical to helping your body rebuild itself during your rigorous marathon training schedule. If you don’t have the budget for professional massages, soaking in cool (50-55 degree) water for 10-15 minutes and then elevating your feet will help reduce inflammation and speed the recovery any damaged tissues. If you’ve been keeping a training log, revisit it to remind yourself of the dedication and hard work you’ve put forth to come this far. Knowing how much you have prepared will boost your confidence going into the race. Rest, relax, eat well, stay hydrated, sleep, and participate in activities that help you take your mind of the big task ahead.